I recently purchased my first random orbital sander for a furniture refinishing project. I found that it worked very well, removing decades of mustard-colored paint with minimal effort. In fact, it worked so well that everywhere I look I see potential refinishing projects where I can use my new sander to take something old or dull and jazz it up a bit! In my experience, this statement applies just as well to the world of training, a world often saddled with finite resources and limited tools for reaching learners—most typically instructor-led training, job aids, or e-learning courses. And when tool options are restricted and every project needs to be delivered “yesterday,” it’s understandable how folks end up framing them all as e-learning courses. Today’s authoring tools make e-learning course creation so much faster and easier, why not just import that content, publish it as a course, and call it done? Unfortunately, lengthy e-learning courses aren’t always the best approach. In fact, a course is often overkill, particularly when the risk of a learner failing to perform a task doesn’t put the organization (or its patrons) in jeopardy. Forcing someone to take a course on a fairly low-risk topic would be a bit like me enrolling in a carpentry school to learn how to use my new sander. So next time you’re faced with a stack of content and a looming deadline, take a few moments to consider what else you can create with the resources you have, instead of, or in addition to, an e-learning course. Not sure how to integrate a compelling but lengthy case study into the training mix? Turn it into a quick, skill-based practice scenario learners can complete on their own. Have a training manual full of instructor-led activities? Turn them into a series of short independent-study exercises that folks can complete online. Time to update that out-of-date training video? Instead of a costly professionally produced training video, ask learners to submit their own video best practices with their webcams. And, if amateur video isn’t your thing? Edit all of the user-generated videos into a few “best of” tips videos organized around specific topics aligned to learning outcomes. This example of curated TED Talks built with Rise should give you a few ideas. Need people to complete a form correctly? Create an entertaining interactive tour like this one from Jackie VanNice. Not sure what to do with an old job aid? Redesign it into a learner-customizable job aid or a hybrid tool like a mouse pad that acts as a shortcut key chart. Have some expert advice to share? Consider recording a series of short audio podcasts, each featuring a topic expert. This approach can be a great way to augment larger training or organizational change initiatives. For examples on using podcasts, check out these awesome contributions from the E-Learning Heroes community. Too much data? Bring that big data down to earth by creating an interactive infographic. Interactive infographics are a great way to make data more tangible and personal to learners. 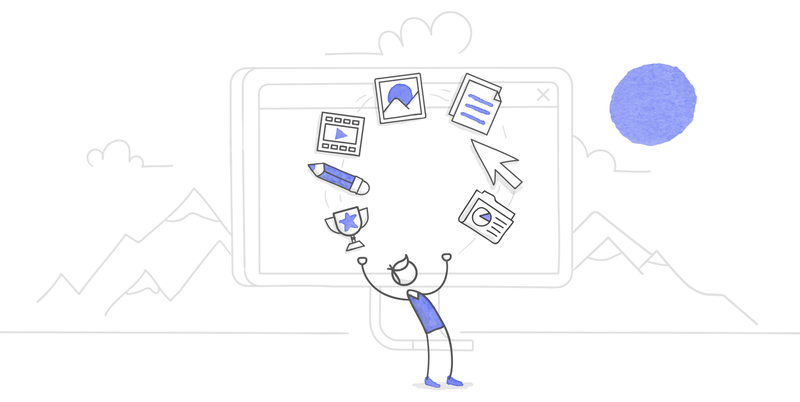 Check out the brilliant community examples in this weekly e-learning challenge for some serious info-design inspiration. Is your software’s quick-reference guide anything but quick? Resist the urge to turn all of that content into a course and instead create a library of short (five minutes or less) “how to” videos targeting critical tasks. Don’t miss this helpful article for some great software simulation and screencasting pointers. Tempted to turn those bullet-heavy, text-laden PowerPoint slides into another click-and-read course? Not so fast. Try morphing the most critical slides into a series of branching scenarios or an app-like decision-making tool that supports performance. How can you make policies and procedures, checklists, forms, or other important resources more accessible and helpful to learners? Use your authoring tool to create an online repository. Rise is great for putting some structure around important documentation. Check out this example for a creative way to gather and organize safety information. How are you embracing alternatives to e-learning courses? What ways are you pushing the envelope with your authoring tools? Share your experiences with a community of e-learning peers by posting in our Building Better Courses forum, or leaving us a comment below. Yes. This. I get so many requests for eLearning courses, and often the content is best suited for an interactive learning byte or a short 15-second video. It is my goal to show my coworkers how to better use the features available within the LMS for general testing, putting a video into the LMS rather than putting a video into Articulate, etc. I don't think they understand that the LMS can still report back information to them if they set it up correctly. Thanks for all of the other great ideas! Thanks for sharing your feedback, Lauren. Sounds like you're doing a great job of educating your organization on LMS features. I hope you'll continue sharing your insights (successes and challenges) in this regard with the community. I think a lot of folks can relate to what you're going through. Thanks for the tips, Trina. Some really great advice there! Thanks, Luke! Glad you found these ideas helpful. Great article. For every project request I always try to recommend developing an e-learning course as the last option. Training isn't always the answer. Right on, Velvet. I think that's a great approach for directing attention towards performance-oriented solutions that may, or may not, encompass training. Great article Trina. I particularly like the short "how-to videos" approach for software product training. It lets users also focus on a particular feature that they get stuck at. Or look at the videos which particularly interest the user, rather than have to watch a whole set of linear instructions to reach a point of interest. Great tips, thank you. I'm looking for a new random orbital sander, which one did you buy? Thank you! Glad you like the tips, Anne! (I chose the inexpensive Black & Decker http://amzn.com/B00MLSS1SW and it did a fine job). Thank you very much! I'll look into it. :) Happy woodworking! ~ Anne Thorp, PhD Set them for success from the start! Great tips. This is awesome indeed! I overcome this challenge by calling everything 'eLearning'. That way I can determine the end result and they can continue to ask for eLearning on every project! A bit cheeky perhaps, but it's really just the terminology that gets in our way here. I love that approach, Renee. What a great perspective. Thanks for sharing it with us! This is such a great article Trina! Thanks :) Could you please precise or illustrate "short independent-study exercises" or " a learner-customizable job aid or a hybrid tool"? Thanks a lot! Hi Ivana. Thanks for reading and taking the time to comment on my article. I've broken down my responses to your questions to, hopefully, elaborate a bit more. First, a short independent-study exercise could take a lot of forms depending on the nature of the material so it's hard for me to be provide a precise illustration of the concept, because it's rather open to interpretation. For instance, one example of this approach might be the use of a hard copy scenario or case study with questions completed by learners. A manager might distribute this activity to their team members to help coach them on more nuanced aspects of their work, or to prompt deeper discussion of complex topics. Later, the manager might get everyone together face-to-face to lead a discussion about their reactions to the situation presented in the scenario. In terms of a customizable job aid, I'm suggesting that learners be provided with a template for creating their own job aid, rather than a completed job aid. For instance, giving learners a chart for a system they use frequently is common in many environments. But what if learners only frequently use a small portion of the short cut keys on that quick reference chart? In this case, it might make more sense to give folks a head start on creating their own chart—perhaps in a classroom setting—to make this job aid concise and useful to each individual. And in terms of my reference to a "hybrid tool," sometimes I think it makes more sense to provide folks with simple performance support that's integrated into their everyday lives and work environments. The example I cited in the article is of a mousepad that also contains shortcut keys, or maybe a phone sticker that contains the company greeting. Another idea might be to integrate some custom screen prompts into a user's computer system to help remind them of the information that belongs in certain form fields, for example. These are just a few quick ideas. I hope they'll help to clarify the concepts for you. I think it's worth noting that we all have different ways of describing different tools and tactics for reaching learners so I wouldn't be surprised if other folks had their own labels and interpretations for these concepts. At the end of the day, the point of my article was to encourage everyone to think critically about all your options for creating solutions that help your learners, rather than defaulting to an e-learning course. Hopefully I've given you and others some food for thought! Great article Trina. I particularly like of the interactive infographics, they are really a great way to make data more tangible.